With Arrow’s fourth season only a few months away, fans have been getting a steady stream of character announcements for the show’s next batch of episodes, from fellow superhero Mr. Terrific to flashback villain Baron Reiter. Unfortunately, outside of Oliver Queen changing his superhero identity to Green Arrow, there hasn’t been much news regarding exploration of the Emerald Archer’s direct mythology, which isn’t too surprising given that the previous three seasons have introduced quite a few individuals from his supporting cast and rogues gallery. However, there are still a few stragglers left to be featured, and if we’re lucky, we may eventually get to see a group introduced in the comics' recent years: the secret society known as the Weapon Clans. We've talked about it. We’ve absolutely talked about it. It comes up in the writers room all the time, and Katana was introduced. We're just waiting for the right story to tell….We love the Weapon Clans, and eventually I'm sure they will end up on the show. Introduced during writer Jeff Lemire’s Green Arrow run, the Weapon Clans consist of seven clans that base themselves around a totem weapon: Sword, Arrow, Spear, Fist, Shield, Axe and Mask. Originally the clans were tasked with fighting corruption across the world, but as time wore on, they began fighting amongst themselves and dealing with corruption from within. Green Arrow dealt with them during the 2013-2014 Outsiders War arc, during which time he discovered that his father Robert had prepped him from a young age to take the Arrow Clan leadership as an adult. The leaders of these clans also comprise the latest iteration of The Outsiders, which in the pre-New 52 universe was a team of outcast superheroes. Few of the members have been introduced on Arrow yet. Robert was the leader of the Arrow Clan at one point, but since he’s dead in this universe, the only way they could explore that connection is through flashbacks. As Guggenheim mentioned, Katana was introduced during Season 3, and in the storyline she was the leader of the Sword Clan. However, given that Deadshot and Harley Quinn were recently declared off-limits to Arrow due to 2016’s Suicide Squad, one wonders if the same fate will fall on the swordswoman since she is in the same movie. 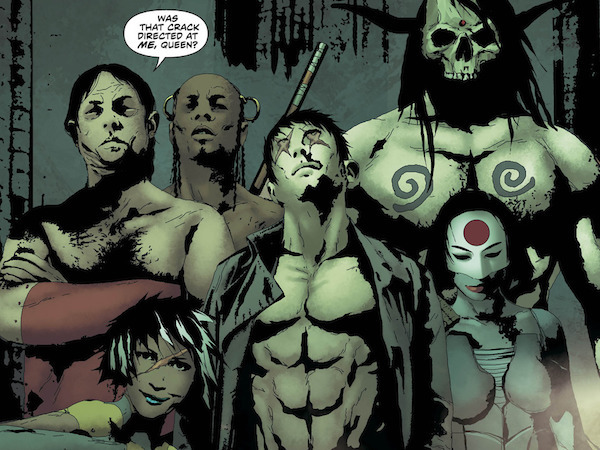 Other Arrow characters connected to the Weapons Clan in the comics include Shado, Komodo and Vertigo, though Shado is dead and the latter two villains don’t really resemble their comic book counterparts. There is a degree of mysticism with the Weapons Clan and their mythology (especially the Mask Clan, whose members can disguise themselves as anybody), and since Arrow Season 4 is delving into magic, the latter half of the season would be a prime time to introduce them. It would be especially interesting if they were somehow connected to Damien Darhk and H.I.V.E., Season 4’s main antagonists.